This kit has been updated by Volquartsen to work with the post-recall Mark IV pistols and pre-recall Mark IV pistols that have been sent in to Ruger for modification under the Ruger recall. Target Trigger with plunger and spring, with pretravel and overtravel adjustments. 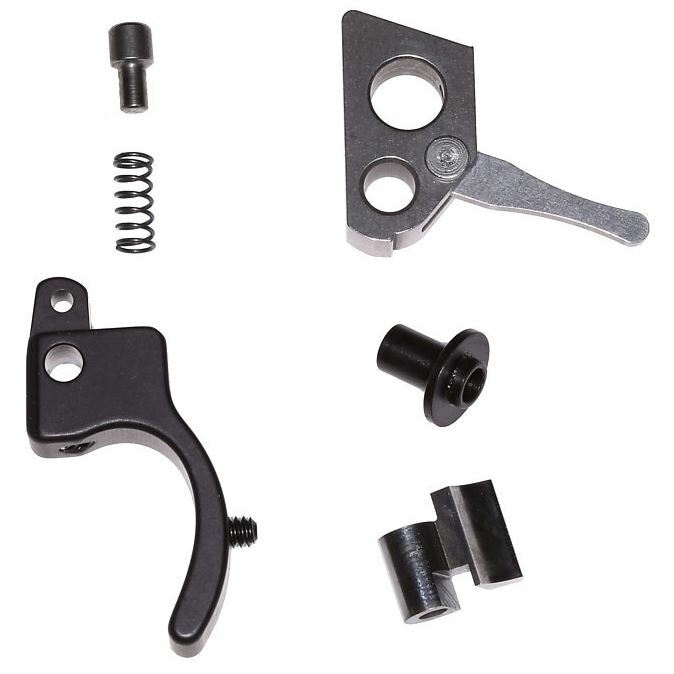 The Accurizing Kit for the Ruger MK IV will provide a crisp, clean 2.5lb trigger pull. This kit will eliminate the magazine disconnect. Kit fits all variations of the Ruger MK IV (including 22/45). Hammer and Sear are wire EDM Cut from A2 Tool Steel. Includes allen wrenches and medium strength Loctite. You have an option of either a Black trigger (shown) or Stainless Steel Trigger. The Stainless Steel trigger kit is $9.00 more. Rimfire Sports & Custom has the best price around for this kit. Everything you need to put a sweeeeeet trigger in your MKIV or MKIV 22/45. Just installed this in my MKIV Target model. It is a HUGE improvement over the original factory trigger. My Ruger now has a trigger that rivals the best High Standard triggers. This kit is worth every penny and then some.